Hidden deep behind the Monday brouha surrounding one of the corners on the Seattle Seahawks was an interesting Peter King interview with Chris Seeger, co-lead counsel for the plaintiffs in the NFL concussion litigation. After Judge Anita Brody quickly rejected the motion to approve the proposed settlement offer on January 14th, Seeger and his team presumably got busy putting together the financial forecasts and economic models that he previously said were used to determine that the $765 million dollar settlement figure would be sufficient to fulfill the obligations according to the terms of the settlement. A few interesting things appear in the interview that may help explain how the numbers might work. The earlier the diagnosis, the higher the payout. Where this works is that the payouts obviously get reduced. So if you take the dementia bucket—level 2 in the settlement—you’re under 45 and you’ve developed dementia, you get $3 million. You develop dementia at age 65—you get $380,000. What does that reflect? If you’re 45 and under, those concussions probably led to your problem. Very highly likely. Now if you develop this at 65, you shouldn’t get the same as someone under 45. Because you’re more likely to have it as a result of the fact that you’re 65. Maybe the concussions played a role, but it’s such a small role . . . 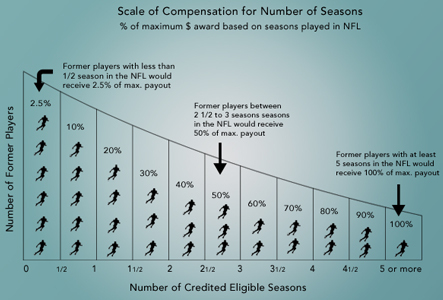 In what Seeger refers to as “our proxy for causation,” players payouts are also determined by the number of seasons played in the NFL. 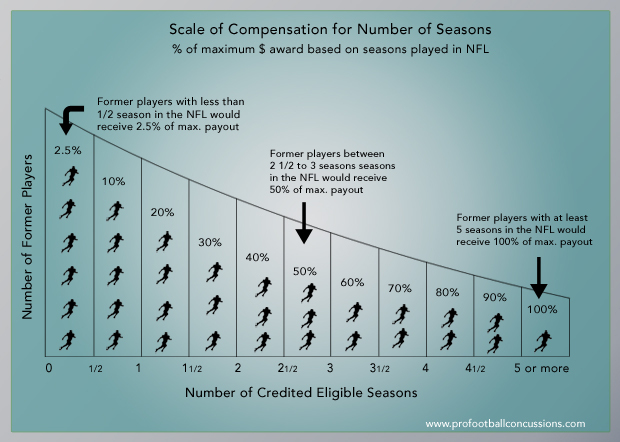 Players with 5 seasons or more receive 100% of maximum compensation (before any other reductions), but an NFL player with less than 1/2 of one season of NFL experience would only receive 2.5% of the maximum payout for his qualifying diagnosis. While these two charts may give some insight into how the $765 million figure may work out mathematically, the amount of the actual payout may still be disappointing to some players. For instance, the payout for the family of a 54 year old man with Alzheimers who played 1 season in the NFL as opposed to the what the family of a 54 year old man who played 5 seasons in the NFL will receive is significantly different. Albeit, the settlement compensation does not appear to be designed to cover the cost of medical care for the related diagnosis. The payouts are simply that – payouts to stop the litigation. Obviously, two 54 year old men diagnosed with Alzheimers may need the same amount of lifetime medical care, but a 5 year NFL veteran will receive $1.6 million while the man with 1 season in the NFL would receive only $160,000. Hopefully, once the financial details are given to the judge, the players and the public will be able to review the numbers and evaluate the terms of the settlement more effectively. Almost forgotten in all of this settlement talk is that Judge Brody never ruled on the impact of the CBA on the concussion lawsuits. The NFL had originally filed a motion for dismissal based on their interpretation of the collective bargaining agreement between the players and the league. An NFL attorney Paul Clement, claimed that the players had no right to sue in court, that the CBA dictated any injury related dispute would be heard in arbitration. Essentially, the process then jumped from the heavily publicized heavyweight court hearing in Philadelphia April 2013 to private mediation talks. Out of those mediation talks arose the surprising settlement proposal. Seeger told Peter King that if the settlement does not get approved, it’s back to court and Judge Brody will have to rule on the motions before her. If it doesn’t, I guess everyone is back to where they were. We’re back to litigating. The players are back to court. Judge Brody will then rule on the motions before her and these cases will proceed through the system, and you know, we’ll see what happens—if they get sliced and diced by the attorneys at the NFL on legal issues where they think the can win … I’m not sure which aspect of the settlement would not be approvable. I’m highly confident it’s not the financial.